These harp pieces have been collected together as a celebration of harp playing in our area over the last fifty years. The pieces themselves have been written by harpers who have been inspirational to us and the pieces vary in difficulty, as we are all at different stages in our harp playing. Our thanks must go to the people who have donated these pieces and to all those involved in reproducing and publishing them in their present format. It is fitting that one of the pieces is dedicated to Violet Hooper who died last year. She was a founder Member of the Branch, its first Secretary and from the sixties she was also Convenor until she retired from both positions in 1989. She worked tirelessly to promote the Clarsach in the area and we would like to dedicate this collection to her memory. Fifty years is a short time in the lifetime of the Clarsach and we are conscious that we are carrying on an ancient tradition which has continued for thousands of years. It is no surprise that the first great masterpiece of European sculpture, where the whole figure in action is fully realised, represents the bard. It was carved over five thousand years ago in Cyclades (Greek Islands) and now sits in silence in the Metropolitan Museum in New York. In Celtic countries Harpers were very important and well-respected. They were poets as well as musicians and were credited with magical powers. They were required to be able to evoke three different emotions in their audience by their music: Geantraighe, or laughter; Goltraighe, or tears; and Suantraighe, or sleep. Perhaps over the years Harpers have lost some of their position of influence and power but the ability of the Clarsach to stir emotions remains and we trust that in another fifty years it will still be played with as much enthusiasm and variety as it is now. We do not want Harps to end up as silent museum pieces, but for harping to be a living, dynamic and evolving musical tradition. The Branch was formed in 1947 by Miss Violet Hooper, her mother Mrs Murielle Hooper from Bristol and Mrs Montague Rivers (Marie) of Stroud who became the first Secretary, Treasurer, and Convenor respectively. At the end of their first year they reported a membership of 35. Regular meetings were held in Bristol and Cornwall and the Convenor travelled to some of these. In the summer the Bristol members went to the Cotswolds for two weeks and had a Clarsach Summer School. They were an enthusiastic group, their main teacher being Miss Marion Bishop, a professional singer and harpist. Apart from the local meetings in the 1950s they made several visits to Ireland, mainly to Moate in Co. West Meath and encouraged a number of young harpers (including Mary O’Hara). In the 1960s the emphasis was on harping in Somerset. After twenty years Marie Rivers gave up being Convenor and Violet took over this role in addition to being Secretary. Through the 1970s and 80s Ceilidhs were often held at Violet’s home or the homes of other members. Ceilidh notices were almost always accompanied by a welcoming, handwritten letter from Violet. Young and old alike were welcomed and encouraged. Violet retired from Office in 1989 but carried on working for the branch until her health failed. The membership has been around 50 for many years and covers a large area from Birmingham to Cornwall. In the last ten years the tradition of Ceilidhs has continued. We have also given Concerts, and taken part in The World Harp Festivals in Cardiff (1991 & 1994), and the Garden Festival Wales (1992). In addition the Branch has held a weekend course every two years, and several day workshops with guest tutors, many of whom have contributed to this book. We have, over the years, built up a repertoire of pieces for ensemble playing as a Branch when we meet for Ceilidhs. These ensemble pieces cover all ranges of difficulties so that the most novice player to the most experienced can enjoy playing together. We look forward to at least another 50 years with a happy harping membership. We are very grateful to the Friends of the Branch who have contributed music which makes this Book possible. The following notes about the contributors are by no means fully comprehensive as they are all multi-talented, busy people and a whole book could be written about each one. Corrina left her native Scotland to study Jazz and Contemporary Music at the City of Leeds College of Music. She then returned to work in a more traditional field of music and was a finalist in the Young Traditional Musician of the Year competition in 1995. She has developed a highly original style combining jazz and folk tradition in both arranging and composing. She is equally at home as a solo performer and with David Milligan, a very talented jazz pianist in the duo Bachué Café Together they have produced their first CD. Her connection with the Branch is just starting as she is to be one of the teachers at the Branch’s Golden Jubilee Workshop. It is a double first for Corrina as her contribution to this book is the first work that she has had published. Recently she has been commissioned to write “Songs of Redshank” for the Highland Festival. Marsaili Stewart Skinner is an original composition of Corrinas, composed on 24th November 1995. It was written for a new-born baby girl - Marsaili, which is the Gaelic name for Marjorie. The piece is in three parts. The first part represents her father, the second her mother and the final part represents herself. Alison is a very talented player of both the gut- and wire-strung harp. She has researched the history of the Clarsach in Scotland, co-writing “Tree of Strings” on the subject as well as producing a Harp Tutor and several collections of harp tunes. She is very well known as a performer of the older Scottish repertoire and is sought after as a teacher. She has an equally successful career as a glass engraver and was awarded an M.B.E. in recognition of her work in both fields. Alison taught our first Branch Weekend Course which was a great success in 1988 and introduced us to the aural teaching tradition. Anne lives in Aberdeen and is a singer and harper of distinction giving recitals and concerts showing her wide range and knowledge of music and superb musicianship. She is a popular teacher for courses workshops and classes and an adjudicator for Festivals and the National Mod. She is a prolific composer and arranger of pieces for the Clarsach. She has for many years had connections with the Bristol and West of England Branch of the Clarsach Society, teaching a course at Glastonbury several years ago which was enjoyed by many of our members. Some have since travelled to Ford Castle for the Northumbrian Branch course and also to the Edinburgh Harp Festival for her classes. Her choice of contributions to the book indicate her connections. Hela ‘r Sgwarnog (Hunting the Hare), is a dance tune. Bugeilio’r Gwenith Gwyn (Watching the Wheat), is a folk song. Pant Corlan yr Wyn (The Lambs’-Fold Vale) is another dance tune. Miss Violet Hooper composed in November 1988 to mark Violet’s retirement from the Executive Council of the Clarsach Society and as the Branch Convenor and Secretary. Isobel is an accomplished harper, singer and composer from Edinburgh. Her versatile repertoire ranges from the ancient ballads and Hebridean airs to songs once heard at the Scottish court and contemporary music for voice and Clarsach. She is a great exponent of the art-form of self-accompaniment. She performs all over the world and is also the director of the harp orchestra, na Clarsairean, for whom she also writes and arranges music. She is a great ambassadress for the Clarsach Society and is currently the Convenor of the Executive Council of the Society. She has been very supportive of the Bristol and West of England Branch and we have been delighted to have Isobel as Guest performer when we played at Garden Festival Wales, and the World Harp Festival in Cardiff. Isobel has also taught at one of our weekend courses and left us a legacy of music to absorb into our Branch repertoire. We are looking forward to welcoming her back as tutor for our Golden Jubilee Workshop. She has contributed three pieces to this collection. Auld Lang Syne - This song is known the world over. This alternative tune for the song, arranged by Isobel, is the melody Robert Burns used in Johnson’s Musical Museum for the words of Auld Lang Syne. Isobel feels it is superior to the better known tune. Buain na Rainaich (Pullin’ Bracken) is a Gaelic melody often called The Fairy’s Love Song. It is meant to be a little wistful in character. Catniona is composed by Isobel for her Grand-daughter Catriona Isobel Jane Melville who was born on 20th February 1996. The Cradle Song by Scott Skinner. Pam is interested in all types of harps and in particular historical music and dance. She spent her childhood in Wales and became interested in the harp through Welsh Folk music. She didn’t have the opportunity to learn harping until she moved to America and was taught by Marjorie Chauvel in California. She has been passionately interested in all types of harps ever since. Pam played a key role in setting up the Transpennine Branch of the Clarsach Society and is still actively involved with its activities. She plays with an early music group, Leeds Waites and also performs regularly as a duo with her husband Alan on pipes at important historical venues. She has published a book of music for medieval harp. Pam gave a workshop for our Branch where she taught many historical tunes and the accompanying dances. The Horse’s Branle is Pam’s contribution. It is a medieval dance and Pam has included the dance instructions with the music of Arbeau which she has arranged. Llio lives on Anglesey, North Wales and is a direct descendent of a long, unbroken line of traditional Welsh Harpers. Taught by Nansi Richards, she is dedicated to keeping the old traditional harp music alive by passing it on, by aural tradition to future generations of Welsh Harpers. Llio was instrumental in setting up “Cymdeithas Offerynnau Traddodiadol Cymru” (The Society for the Traditional Instruments of Wales) in 1996 and is soon to release her first CD. She formed “Telynwyr Llio” - a group of young harpers - who perform traditional Welsh music together. She plays for the groups “Cwtig” and “Penceirddiaid Cymru” and the Welsh Dance Group, Fiddle Faddle. She researches the old manuscripts looking for harp music to perform on a Welsh Triple Harp and a Schwieso and Grosjean single action harp, both formerly performed upon by Nansi Richards. Our members were taught by Llio at a Welsh music workshop in Cowbridge. Polca Rheilffordd Aberdâr This is Llio’s arrangement of a Welsh polka collected by the Welsh Harper Llewelyn Alaw in the middle of the last century. Patsy is from Edinburgh where she did her degree in Celtic Studies. She performs world wide as a member of the harp duo, Sileas, and the group, the Poozies. Their repertoire covers a wide spectrum from pipe and fiddle tunes, Scots and Gaelic songs, with influences from classical, international music and jazz. She taught a weekend for the Branch at Stroud when she displayed her outstanding skill as an aural teacher. She teaches Clarsach to students on the BA course in Scottish Music at the Royal Scottish Academy of Music and Drama. She is an innovator in her musical style who is able to work with new ideas while preserving the essence of traditional music. Patsy has arranged three well known Scottish dance tunes for this volume. The Music of Spey by J. Scott Skinner. This is a beautiful slow air. Dancing Feet by PM G.S. MacLennan. 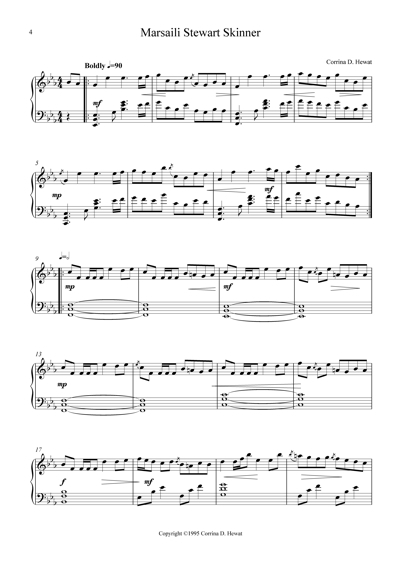 This is a modern pipe tune arranged for the harp. The Spey in Spate by J. Scott Skinner. This is a reel from Aberdeenshire. Wendy has played the harp from a very young age. She was born and brought up in Edinburgh and is one of Scotland’s freshest and most original harping talents. She has developed her own distinctive style which has been influenced by a wide range of music including Swedish, French, Paraguayan and dance music. In fact anything with an odd rhythm and a good tune interests her. Her roots are in Scottish Traditional music, but her compositions and arrangements reflect her wide interest in the music of other countries. She has taught a weekend school for our Branch and is a talented teacher as well as performer either as a soloist or as a member of the band Ceol Beg. She has recently formed a new band, Wendy and the Lost Boys. Wendy is also a part-time tutor for the Royal Scottish Academy of Music and Drama on Clarsach for the BA course in Scottish Music. High Road to Linton is a traditional pipe tune often used in dancing. When the piping and harping tradition was broken in Scotland, this tune was kept alive through Port a ‘Bheuil, the Gaelic “mouth music” for dancing. Roslin Castle is a traditional slow air from the eighteenth century which Wendy first learnt from a collection of fiddle music. Like many people in Wales, Lon first started to play the harp when she received lessons at school. This started a life-long passion for the instrument. In the last ten years she has become more and more interested in non-pedal harps and currently plays single and triple string instruments. In particular, she enjoys researching into and playing Welsh dance music of the eighteenth and nineteenth centuries. She plays for Cwmni Dawns Werin Caerdydd (The Cardiff Welsh Folk Dance Company), Pavane - an early music consort - and Penceirddiaid Cymru. Last year, she was asked to adjudicate the first ever John Weston Thomas memorial competition for non-pedal harps at the National Eisteddfod of Wales. Lon is a very active Branch member. As well as being Treasurer and Music Advisor for the Branch she also conducts the ensemble playing at ceilidhs and concerts. Breuddwyd y Frenhines (The Queen's Dream) is an old tune found in the collection of John Parry Ddall. Bwthyn Fy Nain (My Grandmother’s Cottage) is an old Welsh folk song. Gráinne Yeats, trained initially as a pianist and then a singer. In addition to classical repertoire she loved to sing Irish Gaelic songs which she had learnt from kindergarten onwards. They are traditionally unaccompanied and to add more variety to her performances she learnt to play the Irish harp. She was soon fascinated by its history and the Irish traditional harp music which was largely neglected. 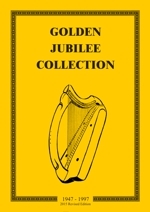 Gráinne was a founder member of Cairde na Cruite, the Friends of the Harp, which was started in 1960 and helped the dramatic revival of the Irish harp. Gráinnes greatest love is for harp accompanying words spoken or sung and for this she has won wide acclaim. Gráinne met some of our Branch members when they attended her classes at the Edinburgh Harp festival - an experience they all enjoyed. Fead an Iolair (The Eagles Whistle) is an arrangement by Gráinne of one of her favourite songs. This air is also called O'Donovan's March.